My Baby is Breech- What should I do next? If your baby is breech near term you should start with gathering information from reliable sources. In my practice, I generally recommend the following advice. First, seek a supportive practitioner! An ultrasound should be performed to determine that there are no obvious abnormalities of the baby or the uterus. Ultrasound can give an estimate of fetal weight, head and feet position, location of the placenta and umbilical cord and general health of the fetal environment. If all appears normal then the option of acupuncture with moxibustion, chiropractic techniques, certain exercises and other noninvasive techniques can be attempted over the next few weeks. Should your baby remain breech then I would discuss the likelihood of success of an attempt at external version (The attempt to manually move a breech baby into the head-down position)&nbsp;around 37 weeks. 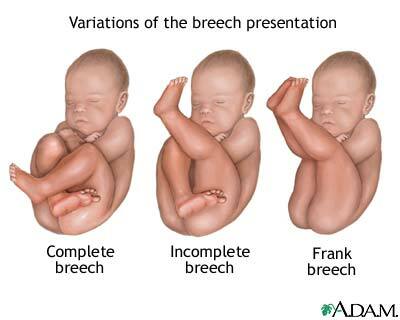 Version is easier when the mother has had other children and the baby is in the complete breech presentation (sitting Indian style) than when in the frank breech presentation (diving pike position). 7) Spontaneous labor and a reassuring fetal heart rate. 8) Right mental “stuff”, meaning trust in your body and the process. If these criteria are met then you have a very good chance of having a successful and safe vaginal delivery. If all these criteria are not met then a c/section may well be the only safe option available. This conclusion is supported by the current literature and, although a woman cannot be forced to have surgery, it would be unwise to refuse in my opinion. However, if these criteria are met then you do have the option of asking to wait for labor and see how things progress. The biggest obstacle might be finding an able and willing practitioner as the skills and desire of doctors to conduct a vaginal breech delivery will slowly disappear in the next generation. I believe strongly that consumer demand for these birth choices is the only thing that might reverse this trend and encourage academic teaching and training programs to save these skills.